Newcomer's Guide to the Afterlife: On the Other Side Known Commonly As "The Little Book"
by DANIEL QUINN, Tom Whalen | Other | This book has not been rated. Since other books by Daniel Quinn have changed my view on this world and our place in it, I am inclined to read everything he has produced so far. But, what category is this supposed to fall in? I have no clue whatsoever. 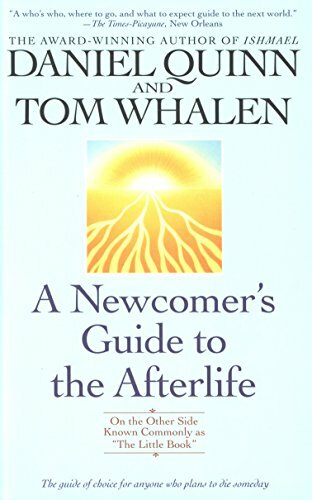 "The guide of choice for anyone who plans to die someday" which is exactly what I am planning to do at the end of my life. Although the idea behind this book seems outrageous, I will give it a shot. Reading it, I mean. What a strange book. I have no clue what to make of it. What Quinn is trying to do here, I think, is to provide a non-religious anser to the old what-happens-when-your-die-question. He wants to show there are other ways to think about these things than the answers that are provided by the various religions. In Story of B Quinn states Christianity, Islam, Buddism and the like have a fundamental problem: the assumption that mankind is essentially flawed and needs to be saved. But, Quinn says, since gorilla's aren't flawed, and dogs aren't, and neither are dolphins, musquitos or daffodils, why should we think that we are? We are no different than any other living creature. This book is back home.